As I begin my journey with cancer, Adrianna Grace is completing hers. I met Adrianna in April of 2006 at a Divine Feminine Institute workshop on Maui. I moved to Maui in June of that year, and we became good friends. I watched her leave Maui and come back several times, and was always happy when she returned to live on the island again. We co-created a few times, and there was always overlap in our work and in our lives. There was never a time when I felt out of sorts with her. Adrianna was diagnosed with stage 4 ovarian cancer a few years back. She had surgery and chemo, and over the course of about 2 years, she healed herself and almost made a full comeback. 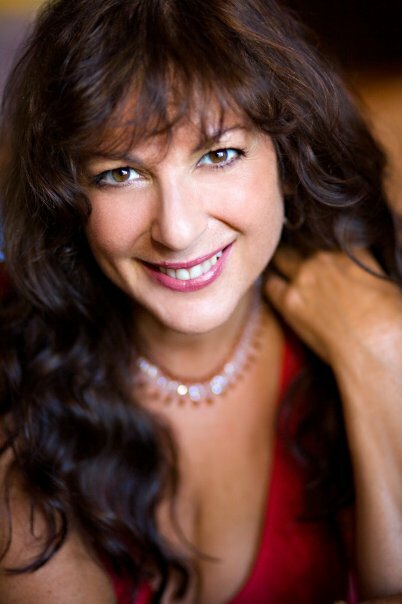 She came back to Maui late in 2012 to begin her professional life again as a colon therapist and vibrant life advocate. A few weeks back, she started having pain and was diagnosed with acute leukemia, a complication of the chemo she received previously. 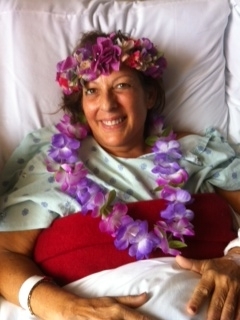 Now she is resting comfortably at Maui Memorial under palliative care. She has created a beautiful field of love and light around her hospital room, where she is being visited by many loving friends and her few remaining family members. I sat with her on Sunday, and she was lucid and still feisty. She’s grieving, of course, and understands that the graceful completion of her beautiful life is at hand. She has maybe a few days or a week left. The nurses who are attending her are loving, compassionate, and very available for her and to those who have questions. 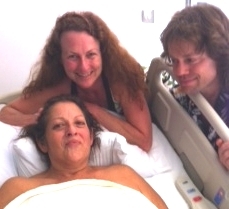 She has three dear friends who are attending to her needs, wishes, and final arrangements: Neeraja, Caress, and Shelley. The nurses are amazed at the quality of attention she is receiving from her visitors. They think she is maybe famous or something. Adrianna is not famous in the traditional sense. She is, however, known to have the biggest heart you can imagine that she freely shares. She’s not all soft and gushy, though… this woman is fierce and opinionated, and she expresses herself honestly but lovingly. She is truly a Queen. The grace with which she has lived her life, especially through her cancer battle, is an inspiration to me. As Apollo and I were sitting with her on Sunday, Neeraja asked her about one of her possessions and what she might like to do with it. Adrianna replied that there would be a later conversation called “bequeathing”. We all got quite a kick out of that. I leaned in close and asked Adrianna what I could do for her. She asked me if I had, in my “priestess bag,” a ceremony to release the spirit from the body. Having felt this call from her very soul over the past couple of days, I was prepared. It was not a ceremony I’ve ever done before, but I knew exactly what to do. I had brought with me an essential oil of sandalwood and rose damask, and I anointed her body and invited her to open her crown and to know that the portal is open whenever she is ready to go. She visibly relaxed and we talked about her next adventure into new realms and dimensions. Is is strange for me, recently diagnosed with cancer, to be at the beside of someone dying of the disease? Not at all. First of all, I’m not afraid of death. I plan to be around for a long time, Goddess willing. But when the time comes, I expect that I will be fully at peace with how I’ve lived my life because I already am. I left feeling the hospital feeling high as a kite. Her energy is so beautiful as she prepares to journey home to spirit, to be embraced back into the oneness from whence we all came. When a body gives out and there’s nothing more to be done except make that body as comfortable as possible, there’s only one thing left that matters, and I’m pretty sure you know what I’m talking about. I’ll see her again on Tuesday after my next round of biopsies, and that will probably be my final goodbye as I leave for the Mainland on Thursday to teach my final Reclaiming Aphrodite workshop in the Bay Area. Adrianna has lived a blessed life, filled with grace…. amazing grace. Journey well, beloved sister. I will miss you and remember you forever with love and affection. If you want to know more detail about Adrianna’s progression, you can visit her Caring Bridge page. Please leave comments below as well. This entry was posted in Death & Rebirth, Grace, Love, Releasing and tagged Adrianna Grace. Bookmark the permalink. Oh my god. Thank you soooo much for who you are and sharing this Amrita. This helps me in my grieving Adrianna and in being human in general. Of course, Jen, it is my pleasure to be in service to Adrianna through my writing. I hope to see her again on Tuesday, and I’ll take a special hug to her from you. I love you, dear woman! My heart is somehow full of hope and uplifted. I don’t know Adrianna personally yet I know her. I pour out love and blessings to you and her. May I be so blessed as Adrianna when it comes my time. Beloved sister you are not alone. Your home is in the heart of everyone who comes to know you even if we have never met, as in our case. I hold you in my heart, whisper ‘sweet somethings’ and I light a candle for you to light your way. Thank you, dear Kym. Your words will reach her on the wings of loving energy and the candle’s flame. Amrita, what a beautiful friend you are to Adrianna. I am deeply touched by your courage, your heart felt writing and sharing. Our love for Adrianna is shining ever brighter each day. Hugs!!!! !